Last week we looked at how benchmark or Olympic average yields have changed since the start of the ARC-CO program. 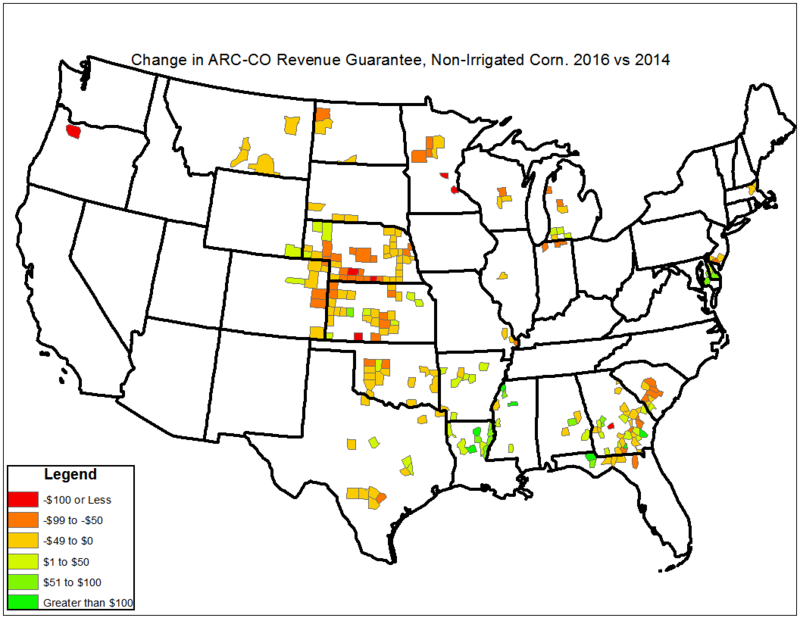 This week we will examine how ARC-CO revenue guarantees have changed across the country. Again, we will see that the results differ widely across the country. While more than half of all the counties in the U.S. saw their Olympic average yield guarantees increase, ARC-CO payments are based upon the combination of prices and yields or revenues. The guarantee prices for corn and soybeans have fallen over the life of the program. For example, corn prices began the program with an Olympic average of $5.29 per bushel and have fallen 9% to $4.79 for 2016. Soybeans saw a smaller decline in the benchmark price falling by 3% from $12.27 to $11.87. Wheat actually saw a slight increase rising from $6.60 to $6.70. The changes in the county revenue guarantees for corn, soybeans, and wheat are shown in table 1. While most (71%) counties saw their corn yields increase, only 31% of counties saw their benchmark corn revenue guarantees increase from 2014 to 2016. 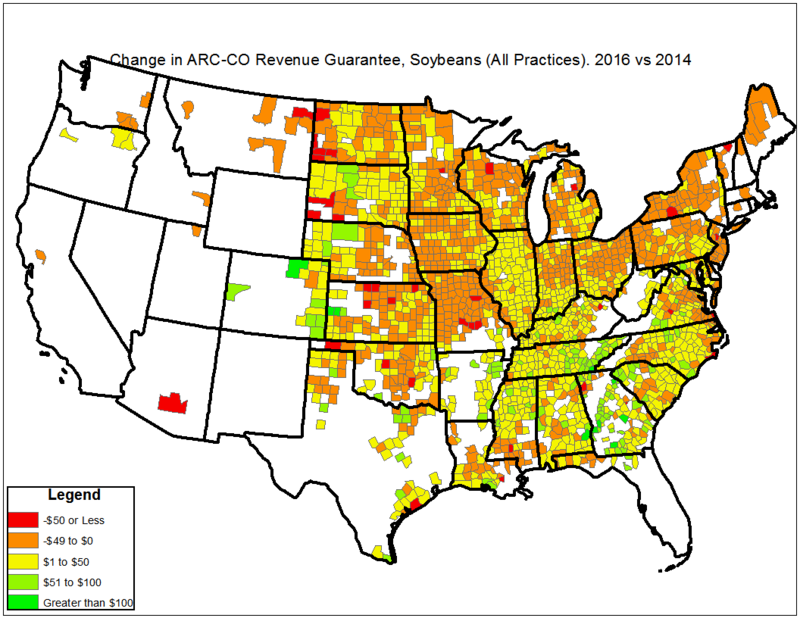 Soybeans were slightly better, with slightly over half of the counties seeing Olympic average revenues climb from 2014 to 2016. On the other hand 75% of wheat producing counties saw their revenue benchmarks increase. The data used to calculate the averages includes all county level yields, combined practice, irrigated, and non-irrigated. The average decline in revenue guarantees were the largest for corn, with the average county seeing a revenue decline of $25 per acre from 2014 to 2016. For wheat and soybeans the average changes in revenue guarantees were small but positive. 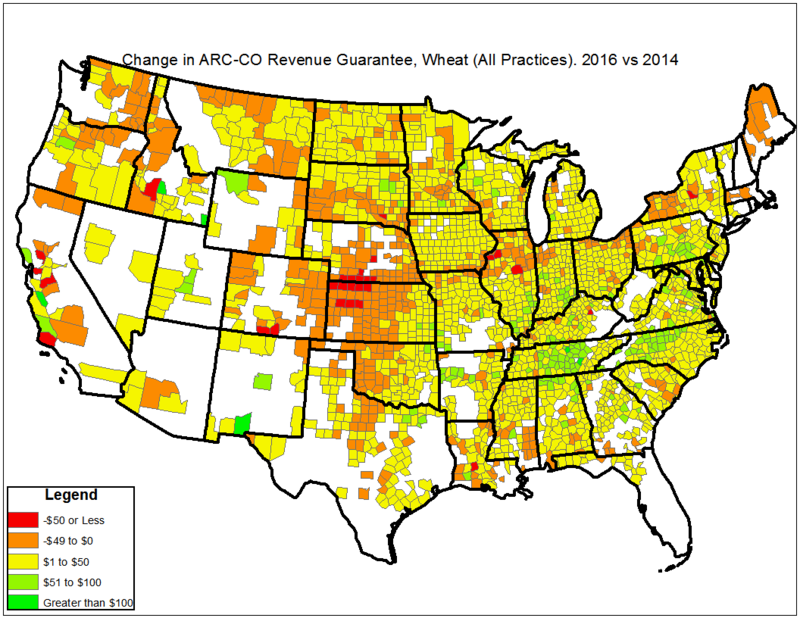 The geographic distribution of the changes in revenue guarantees are shown in Figures 1 (corn), 2 (soybeans), and 3 (wheat). There are a few interesting things that can be observed in these graphics. First, there were several counties that saw rather large declines in benchmark corn revenue guarantees. In the case of corn, counties colored red saw their benchmark revenue decline by at least $100 per acre. These counties are most prevalent in Minnesota, Indiana and Ohio and Texas. Second, there are only a small number of counties in the corn belt that saw revenue increases. For those interested in how the split practice counties fared, click on the links for maps for irrigated corn and non-irrigated corn. Figure 1. Changes in Olympic Average Corn Revenue by County, 2016 versus 2014. Figure 2. Changes in Olympic Average Soybean Revenue by County, 2016 versus 2014. As one might expect the revenue declines were smaller for the case of soybeans and wheat. 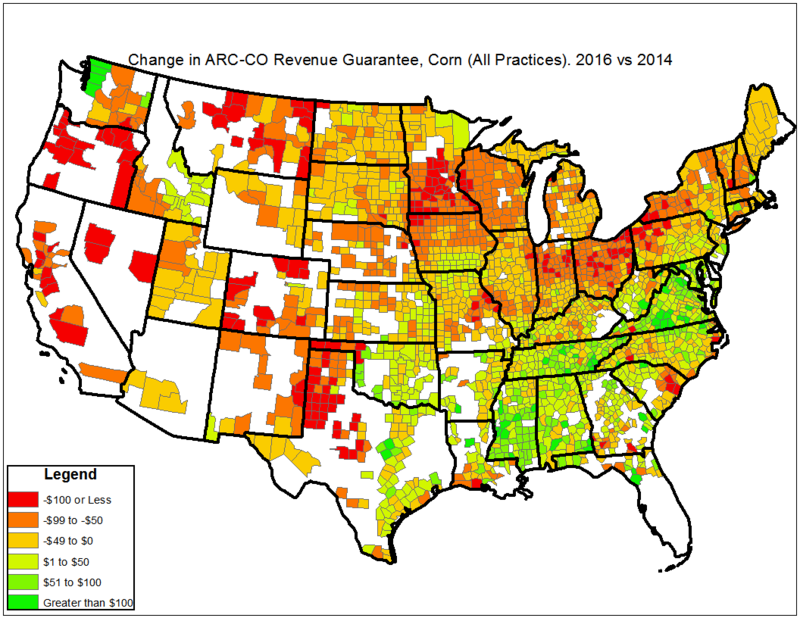 In the case of soybeans and wheat the counties shaded red saw revenue declines of at least $50 per acre. There are a relatively small number of counties that saw declines of this magnitude. Figure 3. Changes in Olympic Average Wheat Revenue by County, 2016 versus 2014. The ARC-CO revenue guarantees have started to decline in many counties. This is particularly true for corn whose price has declined by more than that of soybeans. Unfortunately, it appears that these initial declines are only the beginning and that further revenue declines are highly likely. Take corn for example. Art Barnaby reports that Kansas State’s March 31st estimate of the 2016 market year average corn price at $3.30 per bushel. Unless, the 2016 market year average price is above $3.70 per bushel the benchmark corn price will fall to $3.95 per bushel in 2017. This would be a 25% decline from its initial ARC-CO price guarantee. The potential declines for the 2017 guarantee prices in soybeans and wheat are less extreme, but still point to declines in revenue guarantees. All of this points to the likelihood that government program payments under ARC-CO will begin to decline rapidly with the 2017 crop marketing year. Farmers enrolled in these programs will need to prepare for smaller government program payments in spite of an economic environment that continues to be described as challenging at best.